So, it's been like a week since I last blogged. To be fair, I didn't have much to blog about. I have knit, but barely. I haven't really sewn. I've fake crafted. What have I done? Well, I finished a pretty nice pair of Koigu anklets. Aren't they cute? 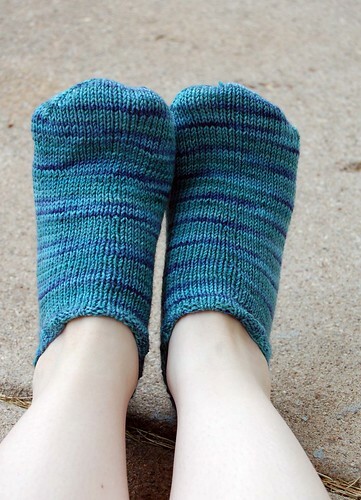 All it takes is one skein of Koigu to make anklets like these. Well, that's true if you have six feet anyway. It's not like one of those skeins is going to cover Paul's feet, even in anklet form. I'm ashamed to admit it, but my legs are really that white, by the way. I'm the palest person you know. It's as if the sun has never touched my skin. If you're thinking to yourself, "Go out and tan" right now -- STOP. I could sit out in the midday sun in the middle of July for about four hours without suntan lotion, and the odds of me getting any darker or burnt are very low. I've got really odd skin. 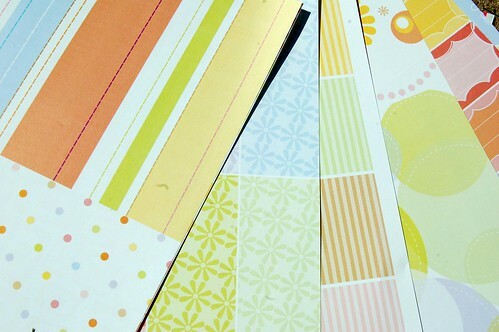 I've been thinking of making some cards because I've got some fairly pretty paper sitting around in my house from a card making kit. I'm still not on it though. I know I need just one or two more items to make cards, but I don't have the energy right now. What have I sewn? Sweet Jesus, all! In my efforts to imitate my new hero, Blair Waldorf, I've decided to wear more headbands. At first, I was like, 'This is brilliant', but then I remembered that headbands cost money. Even the cheap-o ones from my local supermarket. However, if I'm buying cloth anyway... I sewed a simple tube of green fabric tonight, turned it inside out and stuck it over the cheap black headband. Now, it is SUPER cute and green. I can do this with any leftover fabric I have too. I'm basically just making headband covers I can change out. Next step: wearing my hair down more. Next next step: losing weight so that I can comfortably wear dresses or skirts all the damned time. Paul would totally get behind this step and change in clothing style, I bet. Lastly, back to knitting, I'm most of the way down a foot for Helen's socks (ravelry). Whee! They are taking forever, but will probably be one of my all-time best looking projects when completed. In great news, I discovered my size seven 16-inch Addi Turbo circulars too. That means I can happily cast on my Slytherin scarf whenever I have a free moment (ie, never).